the crew sets up for another shot. 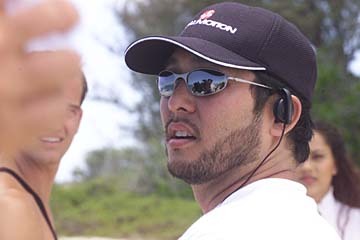 Award-winning independent filmmaker Nathan Kurosawa is back home in Hawaii fulfilling a dream. The Kaiser High School graduate has been on Oahu shooting his first feature film, "The Ride" since last month, using an all-local crew of about 20, as well as five primary actors who are local. "I've always wanted to come back to do a film here," said the former Hawaii Kai resident, who now lives in Los Angeles. "Everyone's been so generous with their time and talents, taking big cuts in (salary) which is the only reason this project is possible." Kurosawa, who is no relation to the renowned director Akira Kurosawa, moved from Hawaii in 1985. "He obviously is one of my favorite directors," Kurosawa said of his name sake. "The Ride" stars University of Hawai'i drama student Scot Davis as a professional surfer from California, whose first priority is making money. Movie extras wait for their turn in front of the camera. Then during a surf contest, the character, named David, has an accident and nearly drowns. He is pulled out of the water by a young Hawaiian surfer and is revived on the beach. 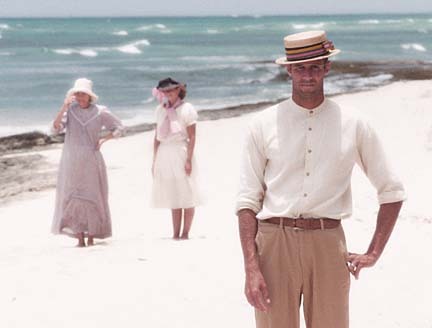 However, he finds himself at a remote, unfamiliar beach, in the year 1911. His rescuer is a young Duke Kahanamoku, played by Sean Kaawa. The female lead Lehua is played by Mary Paalani, a local print and television model. Weldon Kekauoha is Blackie, one of the original Waikiki beachboys; and Johann Bouit is Caps, one of Duke's closest friends. Filming began May 21 with a blessing at the Duke Kanahamoku statue in Waikiki and has a wrap date of June 15, said Kurosawa, 36. The Third Reef Pictures' production is filming all over Oahu including the former Barbers' Point Naval Air Station, Haleiwa, a pond off Likelike Highway, Waikiki and the former Hemmeter Building. The interior of a Haleiwa house is doubling as Duke Kahanamoku's home; the exterior of Duke's residence is a house in Kalihi Valley. Though Kurosawa's water sport of choice is body surfing -- he grew up in the pounding waves at nearby Sandy beach -- he wanted to tell a story about how modern surfing has turned into a competitive-commercial enterprise, losing much of its soul in the process.
" 'The Ride' tries to show the true spirit of surfing and we use Duke as the vehicle to teach that," Kurosawa said. "This is the Duke (before he became famous) no one knows." To maintain historical accuracy, Kurosawa is using several advisors for the period costumes by Cathie Valdovino, production designs by Rick Romer, and the surfing on old wooden boards. The film's cultural consultants include Jay Behrens, Henry Ayau and Wendell Titcomb. Brian Keaulana is water safety advisor. "We're not doing 'Baywatch' here," Kurosawa said. Interestingly, Kurosawa and company had its main casting call for the lead actor in Los Angeles. 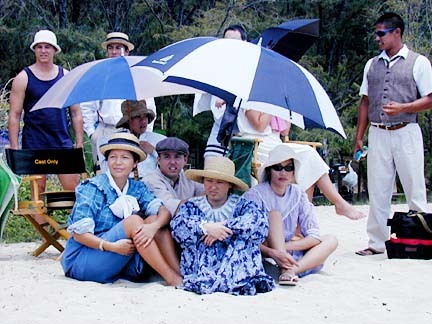 The Hawaii casting was supposed to be just for supporting roles. "Just for the hell of it we brought in some haole guys," Kurosawa said. "When Scott came in he blew us away." Local model Mary Paalani, top, has a leading role in "The Ride." Cathie Valdovino reflect the early 1900s. Third Reef's production offices are two homes in Kaimuki owned by Kurosawa's parents. He hopes to have the film completed in late October or November in time for the Hawai'i International Film Festival, also in November. But the real push may be to show "The Ride" at Sundance in January if it's accepted. Executive producer of "The Ride" is Wesley Nakamoto; its co-producer is Laurie Foi. Kurosawa also produced, directed and wrote the 1996 16-minute film "Kadomatsu" about a Japanese-American father who, while struggling to come to terms with his son's untimely death, ventures into the mountains of Hawaii to collect pine branches and bamboo stalks for the New Year, with unexpected results. poses with his very heavy wooden surfboard.